Artist's conceptions of the extremely metal-poor red giant star S1020549 surrounded by other stars the Sculptor dwarf galaxy. An ancient star discovered in a nearby dwarf galaxy looks tobe long-sought key evidence confirming a leading theory that our Milky Waygalaxy grew by "cannibalizing" other, smaller galaxies orbitingaround it. The star has a low metal composition, a signal that it formedamong the second generation of stars born after the formation of the universe,which occurred 13.7 billion years ago. The start was discovered in a dwarfgalaxy, whereas such stars had only been known in center of the Milky Way, backup the idea that the old stars present in the Milky Way were gobbled up fromsmaller dwarf galaxies. "The original idea that the halo of the Milky Way wasformed by destroying a lot of dwarf galaxies does indeed appear to becorrect," said study team member Josh Simon, an astronomer at theObservatories of the Carnegie Institution. Dwarf galaxies are small galaxiesthat contain just a few billion stars, as compared to the hundreds of billionsfound in the Milky Way. In 1978, astronomers Leonard Searle and Robert Zinn proposeda theory of galaxy formation ? called the "bottom-up model" ? inwhich large galaxies like the Milky Way attained their great size by swallowingup neighboring dwarf galaxies over billions of years. "If you watched a time-lapse movie of our galaxy, youwould see the swarm of dwarf galaxies buzzing around it like bees around abeehive," said astronomer Anna Frebel of the Harvard-Smithsonian Centerfor Astrophysics, who led the study that found the old star. "Over time,those galaxies smashed together and mingled their stars to make one largegalaxy ? the Milky Way." If this was indeed the case, then the same kinds of starsshould be found in both large galaxies such as the Milky Way and dwarf galaxies,especially older, "metal-poor" stars. Old stars have fewer metals (inastronomy, these are any elements heavier than hydrogen and helium) because ittook generations of stars to forge the first heavy elements in their nuclearcores. Stars in the MilkyWay's halo are very metal-poor, with metal abundances as much as 100,000times less than those of the sun, an average star. But surveys over the pastdecade have failed to turn up any such metal-poor stars in dwarf galaxies. "The Milky Way seemed to have stars that were much moreprimitive than any of the stars in any of the dwarf galaxies," Simon said. "If dwarf galaxies were the original components of the Milky Way, thenit's hard to understand why they wouldn't have similar stars." Simon and his colleagues suspected that the methods used tofind metal-poor stars in dwarf galaxies were biased in a way that caused themto miss most of these stars. To find these elusive stars, team member EvanKirby, of Caltech, developed a method to estimate the metal abundances of largenumbers of stars at a time, making the search for metal-poor stars moreefficient. When the team conducted the search on the dwarf galaxySculptor (about 290,000 light-years away), lo and behold, they found a starthat seemed to fit the bill. Spectroscopic measurements of the star's light, taken withCarnegie's Magellan-Clay telescope in Chile, showed that the star had a metalabundance more than 4,000 times lower than that of the sun ? five times lowerthan that of any other star found so far in a dwarf galaxy. 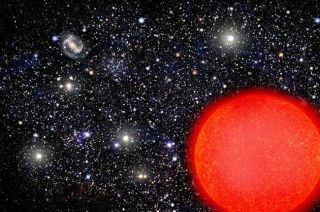 The low metal countmeans that the star may be from the second generation of stars to form afterthe theoretical Big Bang. "This star is likely almost as old as the universeitself," Frebel said. The researchers expect that other searches will discovereven more metal-poor stars in dwarfgalaxies, though one challenge to locating them is the distance and faintnessof such stars. Larger optical telescopes could help remove that obstacle. The research is detailed in the March 4 issue of the journalNature.